And also the generally toxic environment we live in with pollution, antibiotics and other pharmaceuticals in our air and fresh water. Phil: [singing] Oh when the sun beats down oh on the…something, something…ya…. Today I’m talking about soil inoculants. Using a soil inoculant might seem kind of strange so I want to start with why you might want to do it. Now I talk about my two favorites are compost tea and effective micro-organisms. I talk about them elsewhere and they’re good soil inoculants but I primarily think of them as plant inoculants. Like a foliar feed that you spray onto your plants. Today I want to talk about soil inoculants. The reason your soil may be lacking in biological diversity is just some of the things we’ve done over the years to it. It could be tilling, or past chemical fertilizer use, or pesticide use, or general landscaping practices. Or it could be just the generally toxic environment we live in with air pollution and water pollution. Some of these things that make their way into your soil. Today I’m going to introduce you to two of my favorite soil microbial and the first is mycorrhizal fungi. And I remember when I was in the amazon jungle making some videos for you I was talking briefly about the fungi and how when we’re standing in a jungle all of the trees, or most of the trees, are going to be connected but this network of fungi underground. It’s the same in our vegetable garden. And what these guys do is they effectively extend the root system of some of our plants so that they’re bringing up nutrients and water, far from in the soil up to the plants and they’re protecting the plants from plant predators. And then the plants are giving them carbohydrates and other food in return, so it’s this bartering system and this real cooperation that goes on. And not only that but then all the plants are connected through the same fungal network plants share nutrients and other products and even information. What I could do to get this fungi is go into a forest and dig up a little soil and then put that soil wherever I want the fungi to be and that can work okay but what I prefer to do is to buy an inoculant online you can even get them on amazon.com or other places online or in some garden centers and that way I know exactly what I’m getting, I know I’m getting the right fungi for my needs. And so I’m going to show you what this fungi looks like, it’s kind of windy out so I hope it doesn’t all blow. There it is, this one is really micronized into a powder form and it will be on some kind of a carrier like humates or rock dust or something like that. And then this is nice because I can really get it down right around the seed or the plant roots because you don’t want to apply this to the leaves – there’s no benefit to that – this relationship occurs at the root level. So that’s why the best time to apply it is when you’re seeding or when you’re planting or when you’re growing. Even in the nursery! If the nursery applied it that way it’d be great, too. So what I’m going to do – I’ll show you – here’s a tomato plant. And all I need to do is just take a tiny bit of this fungi, this is plenty, all I need really is half a teaspoon or less for this. And just put it on the roots, I don’t have to get all the roots even if I just do one side that’s probably fine – and that way that relationship can happen now. Next I’m onto legume inoculants. So legumes are peas and beans and clover and vetch and these are really important plants in the garden because they partner up, we call them nitrogen-fixing plants, but really what they do is they partner up with nitrogen-fixing bacteria. So they help these bacteria create these little homes on their roots, and then the bacteria can go taking nitrogen out of the air, and turning it into a form that plants can use. And that process is the basis for other other life on earth really because it’s these bacteria that get the nitrogen that allow us and animals and plants to build proteins and amino acids, enzymes things like that. So a really important process. If your legumes can’t find the perfect bacteria in the soil to work with they’ll try to work with other bacteria and if they can find some kind of nitrogen bacteria they can make it work okay, but it’s not going to be optimal. Now you may just be thinking, well, maybe my beans and peas won’t be that great – it’s just one crop it won’t be that big a deal, but to me it’s a big deal because just because of the importance of legumes in improving the soil in our garden. It’s especially a big deal because in every fall I like to seed a cover crop that includes legumes, so I really want them to have their perfect nitrogen-fixing bacteria partners at that point. And so here I have some black beans as you can see and then some pole beans that are more beige. And what I can do with this inoculant – you can buy an inoculant again in a garden center or online especially online it’s easy to find. You can get it in liquid or more of a dry form. I have the dry form here and it’s…there it is…and I just rub it on to all of my seeds at the same time and that’s the fastest way to do it. If I were applying a mycorrhizzal inoculant to these seeds I’d do the same thing just sprinkle it right on there and now I have the inoculant on there and I can plant these. So those are my favorite two soil inoculants: mycorrhizzal fungi and a legume inoculant. There are others that are becoming more popular like trichoderma fungi and there are other nitrogen-fixing bacteria that live freely in the soil not on plant roots and they’re interesting but these are still the tried and true ones, so these are the ones I always recommend starting with. If you have any questions about soil inoculants ask them down below and I’ll answer them. 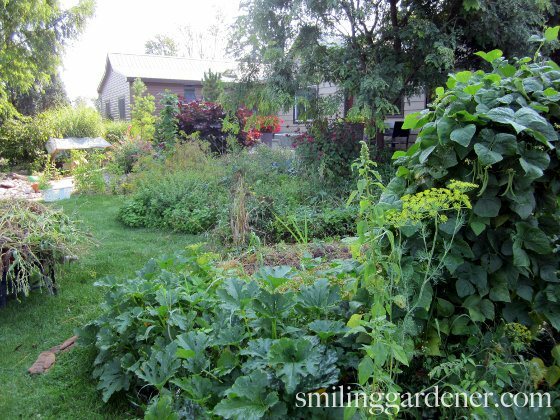 If you haven’t signed up for my free online organic gardening course you can do that down below. And if you haven’t joined me and my sister over on Facebook you can do that at Facebook.com/holy-cow-life’s-so-awesome-and-I-just-love-gardening….dot…net. A lot of this imbalance arose because we’ve tried to control the living world by killing or removing the organisms we don’t want. But now that we know how hard it is to create healthy ecosystems this way, we’re using a new approach instead: restoring the balance by inoculating with the microbes we DO want. My favorite inoculants for foliar feeding are compost tea and effective microorganisms, and they’re good soil inoculants, too. I discuss them elsewhere. But beyond these, there are other ways to repopulate our soils. Here I’m going to tell you a bit more about two very important soil inoculants: mycorrhizal fungi and legume inoculants. 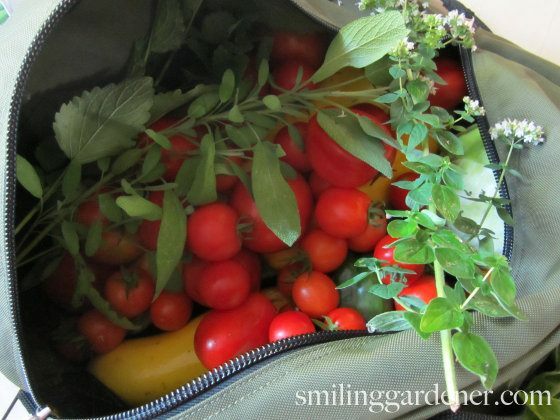 I just visited home and threw a bunch of veggies into my shoulder bag to bring back to Toronto, mostly tomatoes, potatoes, zucchini, cabbages, herbs and garlic (smelled pretty good on the bus). Almost all of the plants in the world, where the native soil is still undamaged, are connected by a vast underground fungal network. Plants will exchange many of the carbohydrates they produce with these fungi in exchange for nutrients, water, and protection from disease. Plants also share immune compounds, nutrients and information with each other through the fungal network. The mystical, unified web of life depicted in the movie Avatar isn’t fantastical at all. It’s right under our feet. The only two food plant families that don’t have known associations with mycorrhizal fungi are the Brassicaceae family (broccoli, cabbage, mustard, kale, etc.) and the Amarathaceae family (spinach, quinoa, chard, beets, etc.). That still leaves 95% of plant species looking for a handful of very common fungal partners, which can often be absent in damaged soils. Fortunately, it’s not hard to restore the mycorrhizal fungi. We can get mycorrhizal soil inoculants by taking a small bucket of healthy soil from a nearby intact ecosystem, or we can be a little more sure by buying them as a soil inoculant from some garden centers or especially online. The advantage of the latter is that you know for sure what you’re getting. Fungal inoculants are best applied at seeding or transplanting time, though they can be watered in later in porous soils. What’s essential is that this soil inoculant makes contact with plant roots, since the root exudates bring it to life. There’s no point putting mycorrhizal fungus in foliar sprays or compost, as it’s the plant roots that form relationships with it. Update: 6 months after I wrote this, I decided to start selling a mycorrhizal inoculant, so if you want to learn even more about this process, you can do so here. The vigorous beans climbing up the trellis in the front right of the photo were inoculated with both legume and mycorrhizal fungi inoculants. The plants we think of as “nitrogen fixers” are actually just great hosts for the microbes that do most of the work. If your peas and beans are lacking in vigor, it may be because they don’t have the right bacterial buddies in their root zone. Most nitrogen fixers are in the Legume family. They seek out their preferred species of Rhizobium bacteria in the soil, and grow clusters of root nodules to encircle the bacteria and provide an ideal home for them. Look for these little pinkish nodules next time you dig up a pea or bean, and see the magic at work. If your legumes can’t find the right bacteria, they’ll try to work with others, but we can help by making sure they have exactly the partners they need to do the nitrogen-carbon dance that keeps all of life swaying to the music. That’s where using a seed inoculant for peas or beans or clover or whatever legumes you’re using comes in. Again, it’s often easiest to buy it online, but some garden centers carry it. I like to sprinkle a little powdered legume inoculant over my seeds before planting. Many new microbial soil inoculants are now becoming available, including some free-living nitrogen-fixing microbes, which don’t need a legume host. There are also non-mycorrhizal fungi such as Trichoderma that seem to protect effectively against soil diseases. These are great if you’re ready to get into the more specialized technical side of organic gardening, but you can make a huge difference to plant health and growth right now by starting with the above tried and true ones. Any questions about how to use a microbial soil inoculant? Or other inoculants? Or soil microbes in general? Let me know down below. I just landsaped my brand new yard (new built home) with dozens of shrubs, 15 trees and ground cover thyme plants (no grass in our yard) about 2 months ago… Then I found your site and the gardeners pantry. Since the I have applied 2 rounds of soil concentrate sea crop, activated EM and molasses. The last round of spray I mixed in the powder fungi and did my best to spray it in to the plants at the base and watered it in afterwards. Is that effective enough to get the fungi to the roots? I think it would be more harmful to dig every plant and tree up and apply to the roots, so that boat has sailed. Would it be worth while to do the watering in of fungi 2-3 more times or would you be confident it will make its way to the roots given a bit of time and watering over the next few weeks? If your soil is fairly porous (i.e. not compacted clay), the fungi should have made their way down to some roots in the first watering, so you should be good to go. Probably no need to apply it again, but no harm either. The EM and Sea Crop is best applied regularly, at least once per season. Your amazing freebie course on soil improvement etc is really terrific and very informative ! Thanks a ton. Only recently did I discover the existence of EM, as it does not seem to be well-known in gardening circles here where I live ~ JHB, S.A. Finding microbial innoculants and powdered bacteria is likely to be a mammoth task here, but I will look for online forums to provide some helpful info to find local sources. Hey marigold PRO-MIX makes a great product called PRO-MIX PUR mycorrhizal inoculant comes in powder, or granular works great for me hopes this helps you. Thanks! It’s often best to buy those things online. The shipping isn’t too expensive (and also not too environmentally destructive, because a 1 liter bottle goes a long way). Probably could a bit, but they may not stick around for long – it’s not their ideal environment. Planting slightly less deeply than recommended or in raised beds gives them warmer soil, which also speeds sprouting and growth. If peas have never grown before in your garden, sprinkle the seeds with a bacterial inoculant, available in stores, so plants can make use of atmospheric nitrogen as fertilizer. My yard (established almost 30 years ago) of St Augustine and Bermuda was weak & dying more every year, even new sections of sod seldom took hold. 3 years ago I found out about Microlife (and another I forget the name of) soil food to increase microbial life in the soil. After a couple years of applying the Microlife products (as well as bagged sheep and cow compost) the yard recovered very well. Especially helps if you include aeration to allow the particles to fall and wash into the soil. I assume it has also helped my garden patches. Missed this year so getting time to reapply the goodies. Have also been planting annual rye grass every fall. Just a pain to keep the lawnmower active thru the winter!! Thanks for sharing! One point people should note is it is very helpful to apply most of these microbial products regularly, and it may be a couple of seasons before the benefits kick in. Can you apply theMycorrhizal fungi at any time of the year? Ya, but I prefer a time of year that’s not too hot and that has some regular rain (or second best is irrigation). That’s when they’re happiest, and it will give them a chance to establish. Hi, Thanks for all the great information. If I was to apply an microbial innoculant, can I then apply Magnesium Sulfate or Sulfate of Potash(in the future), or will these harm the bacteria. Is it a good idea to put out the innoculant with Molasses or something else to help feed the microbes.Thanks again. Steve. Good questions. Sulfur does harm microbes. I would tend to put the sulfur products out first, wait a few days, then put the microbes out. And yes, molasses or another sugar source is generally a good idea when using inoculants. Hello Phil,I’ve recently picked up your book- I’m enjoying it so far.I have a question for you that needs a quick and dirty answer. I’m creating a circular bed- 50′ diameter mandala on a field that has grown pretty much nothing but weeds for years. I’m in a cold climate- zone 5, high dessert, sandy soil, alkaline. I’m ordering mushroom compost and i’ll till it in even though I never till- this will be an exception for me. I’d like to add some friends to the soil, but what products? I’d prefer trying to make something at home if there is a simple way (maybe a video or two to watch)- like the rice brew you mentioned in your book. I’m hoping to get chickens also in the spring to take care of the cover crops I’ll be sowing soon after getting the compost in- hairy vetch and winter rye, if not I’ll be tilling them in the spring. Should I wait to add the friendlies to the soil until I’m done tilling?So- to be clear, I need some quick, inexpensive ways to help build the soil life out there, at home stuff or what products and when to add them.Thanks, for doing what you’re doing- being so willing to share info is a gift. My favorite product is called Effective Microorganisms or the similar products made by SCD. It’s quite inexpensive (you can buy it online), goes a long way, and is much easier than brewing something of your own. I would tend to apply it before tilling, but either way is fine. When you seed your vetch, it would be nice to inoculate it with Rhizobium bacteria. When you seed your grass, it would be nice to inoculate it with mycorrhizal fungi. Hope that helps. Thanks, Phil. The Rhizobium bacteria and mycorrhizal fungi, I’m assuming, are also available online, correct? Can you post a link where I can get all these or are they available on amazon? Yes, both are fortunately available from amazon. Sorry Steve – didn’t see this before. Diluted sea water should be good for microbes, as should the lime and dust. I started all my seeds in doors and I put some (about 1 teaspoon powdered in 8 oz of water). I squeezed a little bit in each container; all of the plants sprouted their first two leaves and NEVER progressed; here we are 10 weeks later and they have only the original two leaves; I had bought non gmo seeds. the beans / peas that I planted directly (dipped in the innoculant) grew fine.. any ideas? I just had to go and buy all from local greenhouse. Hmm, my guess is that it’s something else. At the end of last season I started getting mushroom compost at a place that grows mushrooms (button, crimini, oyster, portabella) and puts out bags of compost every week. Most of the bags have mushrooms growing out of them, so that’s a culinary bonus and an indication that the fungi is alive and well in that compost. So far things seem to be growing well in my soil in which I have put a lot of this. I’m told that the soil base is horse compost, but there is a ton of straw in it as well. When I dump it out of the bag I can see white networks all through it. And here and there in my garden mushrooms pop their heads up. So what do you think of this medium as an inoculant? There seems to be a lot of live fungi matter in it. Mushroom compost from conventionally-grown mushrooms may have a lot of pesticide residues. And even if organic, the mushrooms have probably taken a fair amount of nutrition out of the compost. So I can’t say it’s the best compost, but if it’s available to you affordably, it may be worth using. It’s hard to say for sure because in theory there could be some issues, but in practice it may have some benefits. I agree, the white mycelium network is a good sign. Thank you, Phil, for your thoughts on mushroom compost and all of your wonderfully helpful, cheerfully and artfully delivered information. I started using it because friends were raving about it. I also use chicken compost from friends who have free range chickens, horse compost from a friend who has horses, and lots of seaweed, in addition to my own fruit and veggie scraps, ground up egg shells, some sawdust, and ashes from my friend’s wood stove. I imagine that adds a fair amount of nutrients where the mushroom compost would fall short. I’m just thinking that the mushroom compost would add that fungal and mycelium network component. If the fungi start growing, that’s great. But whether or not you’re adding much in the way of biological diversity, I’m not sure. A few species of fungi isn’t much among the tens of thousands of species of microbes we hope to have in the garden unless they’re really important species such as mycorrhizal fungi. But ya, if you get to harvest mushrooms, that’s really cool. How does drip irrigation harm the soil food Web? It seems to always be what is mentioned as the best way to water the garden. How would you recommend watering the garden? Drip irrigation is often set up to water just the plant, not the soil, so much of the soil is dry, which doesn’t adequately support the life there. I prefer anything that waters the whole soil area – microspray irrigation, sprinkler, even soaker hoses if they’re laid out properly (although to get the whole soil area, that’s a lot of soaker hose).